In the world of business schools, being published in the Financial Times Top 50 list of research journals is a big deal. This is the list of journals that the Financial Times uses to rank the research productivity of business schools worldwide. The reviewers of these publications are considered to be the best among the best around the world. Their selection criteria are so rigorous, the revision process leading up to publication so intense, the work that makes it into these journals is widely read by academics and students all over the world. Acceptance rates in these publications are low, so having a paper published is a high point for someone’s career in business or management scholarship. 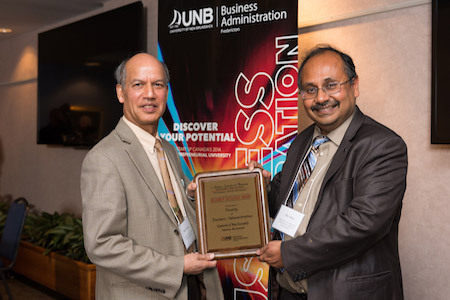 In recent months, two business professors at the University of New Brunswick Fredericton’s faculty of business administration had a total of five research articles published and accepted by journals included in the Financial Times Top 50: Dr. Jeffrey Frooman, who teaches finance and business ethics courses, has published four; and Dr. Patrick Bruning, who teaches courses in leadership and organization studies, has just had one article accepted. In the past five years, two other faculty members published in the Financial Times Top 50; Dr. Jeff McNally, who teaches human resources management; and Dr. Donglei Du, quantitative methods. Another internationally respected list of journals is the Australian Business Dean’s Council Journal (ABDC) Quality List, which categorizes publications according to the quality of the research. Several business administration faculty members have published recently in the top two categories of this list, the A* and the A. In some cases, they have published multiple articles. These authors include Dr. Doug Flint, who teaches human resources management courses; Dr. Donglei Du, Dr. H.A. Eiselt and Dr. Abdur Rahim, quantitative methods; Dr. Gopalan Srinivasan, Dr. Jeff Frooman, Dr. Eben Otuteye and Dr. Dinesh Gajural, finance; Dr. Ibrahim Shaikh, strategy; and Dr. Hsin-Chen Lin, marketing. Four of the UNB authors who have published in the top tier journals included in these two lists, are recent hires to the faculty. Bruning and Lin joined the faculty in 2014, Shaikh in 2015, and Gajural in 2017. For more information, contact Liz Lemon-Mitchell with the faculty of business administration. Learn more about our professors.